For over 450 years, the coastal enclaves of Daman and Diu on the Arabian Sea coast were part of Portuguese India, along with Goa and Dadra and Nagar Haveli. Goa, Daman and Diu were incorporated into the Republic of India on December 19, 1961, by military conquest. The territory of Goa, Daman and Diu was administered as a single union territory until 1987, when Goa was granted statehood, leaving Daman and Diu as a separate union territory. For over 450 years, the coastal enclaves of Daman and Diu on the Arabian Sea coast were part of Portuguese India, along with Goa and Dadra and Nagar Haveli. Goa, Daman and Diu were incorporated into the Republic of India on December 19, 1961, by military conquest. 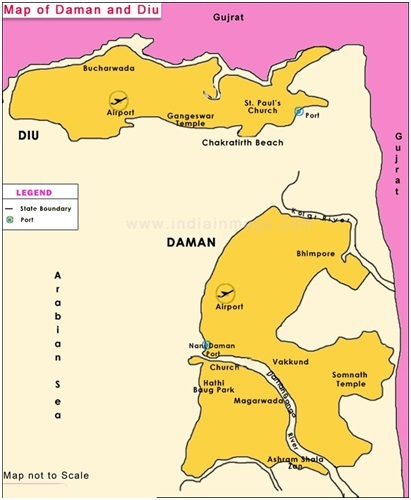 The territory of "Goa, Daman and Diu" was administered as a single union territory until 1987, when Goa was granted statehood, leaving Daman and Diu as a separate union territory. Daman is having a pleasant climate all over the year. In summer, Daman is blessed with cool breeze coming from over the Arabian sea. Maximum Temperature is 39 degree centigrade and minimum is 11 degree centigrade. The average annual rainfall is 1687 mm. Daman can boast of a rich and multi - faced cultural heritage. Dance and Music are very much part of the daily life of Damanite. Here is a true fusion of cultures - tribal, urban, European and Indian.This ornate amalgam is reflected in the traditional dances of Daman. Various Portuguese dances are well preserved and still widely presented.Tribal dances with caustic social comments are much in vogue. Road length; Daman-191,Diu-78, NH22 kms.